brought to the attention of claimants currently using the CCBC. comes under the jurisdiction of the judges of that court. centre once the action has been transferred. The claim number will remain unchanged. 3.2 The Centre User must use the Secure Data Transfer system (SDT) to issue their claims. suggest alternative claim issue dates if necessary. circumstances with the agreement of the Centre Manager. b) include a brief summary of the claim in the claim form. trace the defendant. Failure to do so may result in the application being refused. 5.4.2 The CCBC shall notify the Centre User of the result of their applications. via SDT by the Centre User. Judgments shall be despatched to the defendant only. order, the Centre User may submit a request for judgment by admission. and a completed form N225 or N225A as appropriate. (available on request) to the defendant�s admission. transferred to the defendant�s �home� county court hearing centre (see 5.12). without hearing] ) and despatch to each party. cancelled or satisfied, as appropriate. made directly to himself by the defendant, where there is a live warrant. the Acknowledgment of Service directly to the CCBC User. the CCBC user which details the responses filed that day. 5.9.1 The CCBC shall treat all defences as a �states paid�. schedule on the user. The user can then access the defence via Money Claim Online. defendant�s response, the Centre User shall write in requesting for this to be reviewed. Judge. Alternatively the Centre User may send in an intention to proceed. notice� with the appropriate fee and the application will be referred to a District Judge. 5.9.6 The Centre User shall produce a Directions Questionnaire to be returned to the CCBC. transfer to the claimant�s local county court hearing centre. through mediation the CCBC will send a Notice of Transfer to all parties. judgment request can then be included in the next XML submission. appropriate county court hearing centre (see 5.9.6). the Centre will still account for the application fee and transfer the claim. part admission via Money Claim Online. defendant�s response the Centre User shall write in requesting for this to be reviewed. District Judge. Alternatively the Centre User may send in an intention to proceed. which the Directions Questionnaire should be filed with the CCBC. 5.11.4 The Centre User shall produce a Directions Questionnaire to be returned to the CCBC. resolved through mediation the CCBC will send a Notice of Transfer to all parties. bar and the judgment request can then be included in the next XML submission. categories: pre and post judgment. court location code in the request. transfer in case number order. transfer should not be submitted to the CCBC in these instances. reason for rejection (e.g. the case has already been transferred). shall notify the Centre User of the result of all his applications. remove the defendant�s name from the Register of Judgments, Orders and Fines. Such applications will not be granted and will be referred to the district judge. 5.14.1 The CCBC shall forward a copy of the defendant�s application to the Centre User. a determination of means calculator (available from the CCBC). guidelines (available on request) to the defendant�s application. from the CCBC), when requesting the court officer to fix the rate of payment. transferred to the appropriate local county court hearing centre (see 5.12). amount of the instalment order. 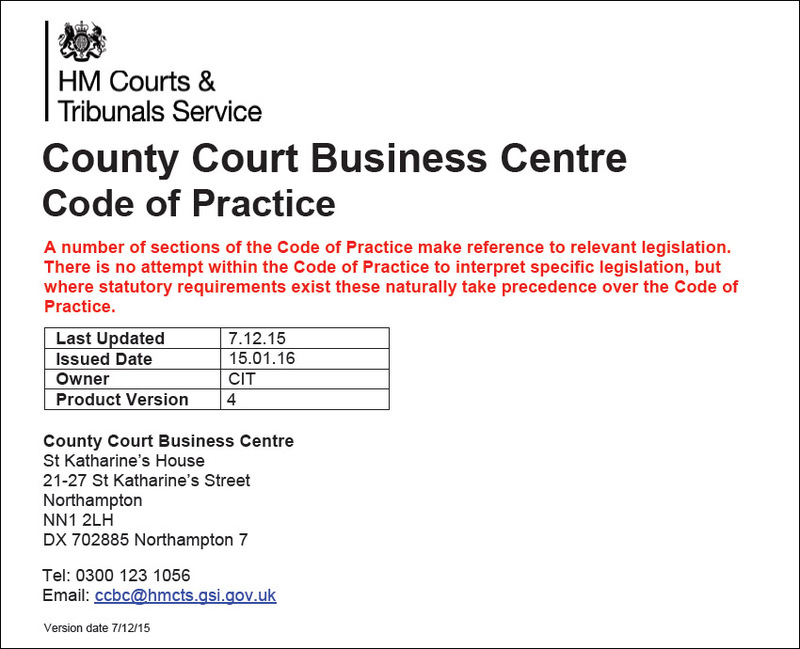 defendant�s local county court hearing centre (see 5.12). 5.15.1 The Centre User shall submit all requests for warrants of control by XML. number, warrant number and the defendant�s address. court location code in the request form. There is no fee to reissue a CCBC warrant. 5.16.2 A new warrant number will be provided following reissue. 5.17.2 The CCBC will check and seal the N293 and return the same to the Centre User. and the appropriate fee to CCBC. Open from Monday to Friday 10am to 4pm. Copyright � 2016 Allied Factors Limited. All Rights Reserved.